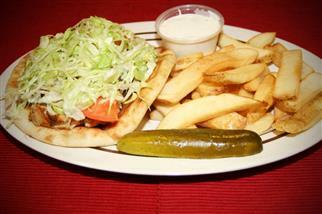 Served with Greek dinner salad and fries. Combination of pork, gyro and chicken. A Grecian delight of beef tenderloin marinated in spices. A Grecian delight of chicken tenderloin marinated in spices. A Grecian delight of specially prepared lamb and beef with special wine sauce and Greek pita bread. A Grecian delight of pork tenderloin marinated in spices.